Just when I thought that the defenders of Apartheid Israel and racist Zionists couldn’t go any lower along comes the affair of Leanne Muhamad. Leanne, who is a 15 year old school girl, a British Palestinian whose relatives are still in Gaza, spoke impassionately at the Speak Out challenge run by the Jack Petchey Foundation about her experiences. For a 15 year old girl it was a magnificent speech. It clearly came from the heart. She described how her baby cousin had died of heart problems in Gaza because of Israel’s Nazi style blockade of the territory. Leanne spoke of her hopes and dreams and spoke of how terrorism had no religion. Watch it and see for yourself. The audience enthusiastically applauded her and she won this particular stage. But then the censors moved in. A particularly racist Zionist @EdgarDavidson81 complained. The Jewish Chronicle, which is edited by the cold-war -hawk and apologist for pro-Israel anti-Semites, former Daily Express editor Stephen Pollard, stepped into the fray. Leanne has been deluged with hate mail from Zionists as a result. Please sign the petition below and share with others so that the Jack Petchey Foundation and Wansted High School know that the overwhelming majority of British people reject Zionist censorship. If the lies above are to be believed, the video of Leanne's speech was removed from the Jack Petchey site in order to protect her! Leanne should go onto the finals of the speaking competition as was originally intended before the censors stepped in. Leanne Muhamad of Wansted High School won the "Speak out" challenge after giving an impressive performance to enthusiastic applause. 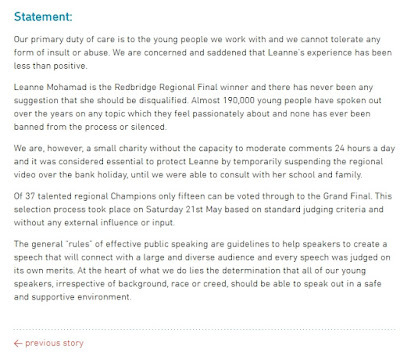 However one day later, following complaints from the racist anti-Palestinian blogger @EdgarDavidson81 to the Speakers Trust (the charity that trains the students to take part in the Speak Out Challenge) the Jack Petchey Foundation and Wanstead High School, the judging panel have now decided “unanimously” against sending Leanne Mohamad through to the final rounds of the competition. "two fundamental rules that are made explicit during the training”. UPDATED: The Jewish Chronicle erroneously reported that “Following complaints by blogger Edgar Davidson to the Speakers Trust” the decision was taken not to put her through to the grand finals. They had already taken the decision to censor her. 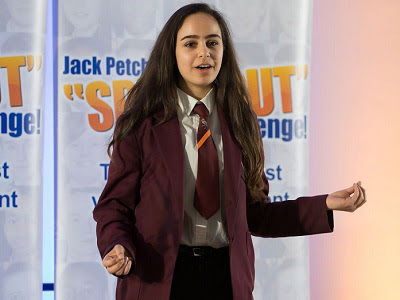 A British Palestinian school girl, Leanne Mohamad of Wanstead High School, won the “Speak Out” challenge after giving this impressive performance to enthusiastic applause. But a day later, Speakers Trust decided Leanne will no longer be sent through to the grand final of the public speaking competition. It seems that giving a personal account of the Nakba and a plea for an end to discrimination against Palestinians is not acceptable in the UK in 2016. 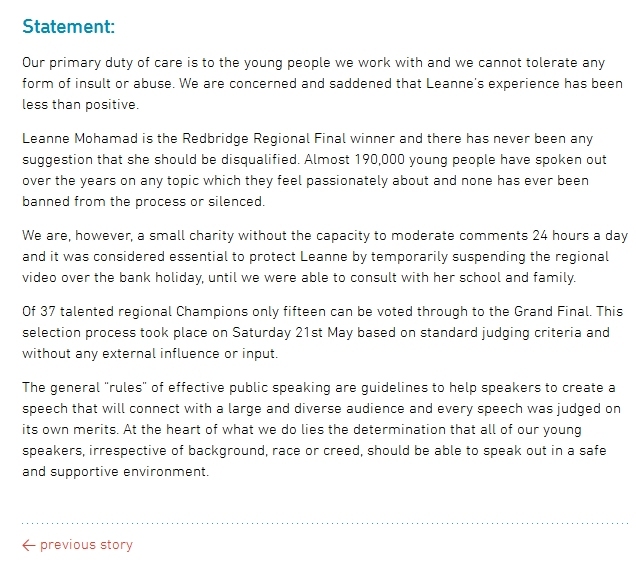 Competition organisers Speakers Trust have removed the video from their website, Speak Out Challenge, and their YouTube channel. Copy below. 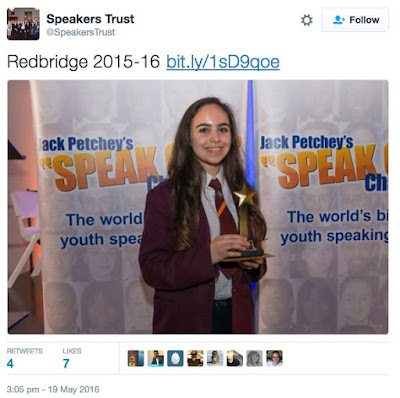 The Free Speech on Israel network object to the undue influence that was imposed on Speakers Trust; 15 year old Leanne Mohamad should have been allowed to go through to the final. Rabbi Elli Sarah is a Liberal rabbi in Brighton and Hove. Liberal Judaism is supposed to be the most progressive form of Judaism, however Zionism has dragged it to the Right. Reform Judaism, of which Liberal Judaism is a variant, wished to update Judaism in the 19th century in line with modern capitalism. It was to Orthodoxy what Protestantism was to Catholicism. Reform Judaism's reaction to Zionism when it first emerged was hostility. 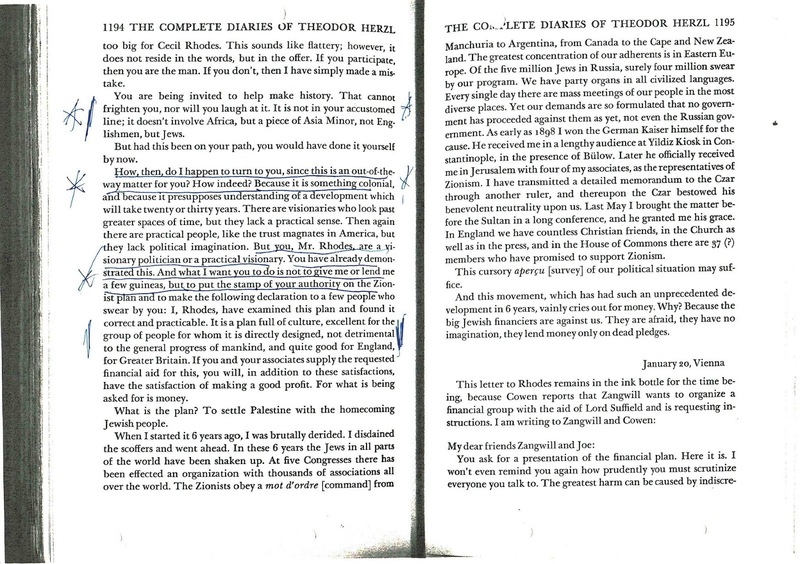 It rejected outright the idea that the Jews were a separate nation. That was the view of the anti-Semites and Reform Judaism wanted nothing to do with those who would reverse the tide of Emancipation. 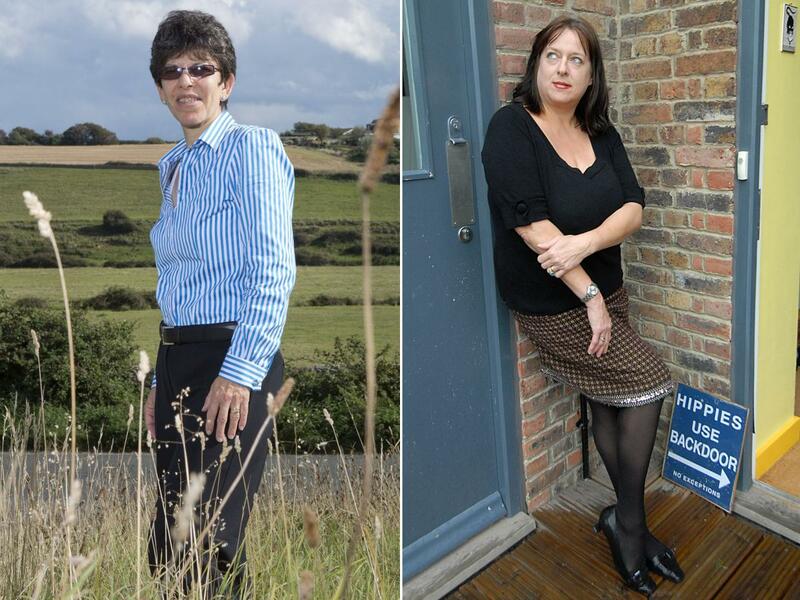 In one of the more amusing incidents of the social calendar, Rabbi Elli Sarah invited Julie Burchill, the non-Jewish Zionist Islamaphobe into her house and was dissed for it. Elli Sarah doesn't see the irony that the Palestinians invited the Jews in their homeland and were expelled by way of gratitude. Elli Sarah herself achieved a measure of notoriety a few years ago, because she is an openly lesbian rabbi. My father was an Orthodox Rabbi. If he and his fellow rabbis had their way Elli Sarah would have gone the way of Lot’s wife – turned into a pillar of salt! But Elli Sarah has, along with many political gays, moved to the Right. Elli Sarah has written an essay entitled ‘WhyAnti-Zionism is Anti-Semitism – but criticising Israel isn’t’ Her essay is a good example of how people can genuinely believe that what they write is profound and original, even though it is little more than an echo chamber for the received wisdom of establishment politicians and their media outlets. Clichés and hackneyed phrases are dressed up as original. Elli Sarah’s thesis is that anti-Semitism equals anti-Zionism. It is a rather common theme. Abe Foxman of America's right-wing Anti-Defamation League said, ‘Anti-Zionism 99 percent of the time is a euphemism for anti-Semitism.’ Elli Sarah is not being new or innovative in her thesis. All that she is missing from her essay is a description of Jewish anti-Zionists as self-haters’ and traitors. I have a different take. Anti-Zionism is never anti-Semitism. They are polar opposites. If anti-Zionism is anti-Semitic then it isn’t anti-Zionism. Anti-Zionists as individuals may, rarely, be anti-Semitic but anti-Zionism is a political ideology that is as different from anti-Semitism as chalk from cheese. Rabbi Sarah has a saying on her website ‘At its heart, Judaism is about… trouble-making.’ Unfortunately this is not true, and Rabbi Sarah is the best example of why Judaism today is a religion of conformity, obedience and racist apologetics. Judaism has not had had the equivalent of the Catholic’s liberation theology or even the Protestant Reformation. One would have to go back to the prophets to find religious figures prepared to admonish the false priests and the worshippers of the golden calf. That is why the Zionist movement is more happy with the Book of Genocide (Joshua) than the Book of Prophets. The ability to cloak superficiality in the clothes of profundity is a useful skill. It’s how people like Andrew Neil and David Aaronovitch make a living. However it only serves to reinforce peoples’ prejudices whilst turning most people off politics altogether. Its trade is in cynicism. Ms Sarah’s essay asserts that which it tries to prove. The theme that anti-Zionism = anti-Semitism is the constant of every gutter Zionist and rabid nationalist. The kind of people who march with their blue and white flags wrapped around them shouting ‘Israel lives’. They proclaim their righteous nationalism in Palestinian blood. Ms Sarah graciously allow us the right to criticise the policies of Israel (but not too many of them) but we are forbidden to question where these policies and practices originate. We can condemn the sinner but not the original sin. Elli Sarah doesn't have a clue why Ben Gurion wrote this or if she does she won't be letting on because it would mean admitting that on the even of the holocaust the Zionist moving was desperately trying to prevent German Jews reaching any other refuge than Palestine, which the British had all but closed to new immigration. The Zionist response to the Evian Conference which Roosevelt had called in 1938, on the even of war, was one of unmitigated hostility. In the fairy tale history that is now painted of that period the idea that, as Ben Gurion said, it would be better for the refugees to die than go anywhere other than Palestine is not one that is admitted to. Hedi Epstein became, like a number of holocaust survivors a Jewish anti-Zionist. In her case this was because of the massacre of some two thousand Palestinians in 1982 in the Sabra and Chatilla refugee camps. The massacres were carried out by Israel’s allies, the Lebanese Phalangist militia. Israel had invaded Lebanon in 1982, killing some 20,000 people. The PLO fighters had evacuated the camps shortly beforehand and they contained mostly old people, women and children. Israeli troops lit up the night sky as the Phalangists went about their work, which included disembowelling and cutting off the breasts of women and castrating young boys. The Phalange were named after Franco’s fascist Falange, and the alliance had been pioneered by the Israeli Labour Party. Hedy Epstein was arrested at Fergusson Missouri aged 90 protesting the racist murder of a Black teenager, Michael Brown. According to Elli Sarah, Hedi Epstein was an anti-Semite. Indeed not only Hedi Epstein. In 1938 the anti-Zionist Bund gained 17 out of the 20 Jewish Council seats in Warsaw and 61% of the Jewish vote in Poland. It formed together with the Polish Socialist Party the ruling bloc in Warsaw and Poland’s major cities. The Zionists gained precisely 1 seat in Warsaw. 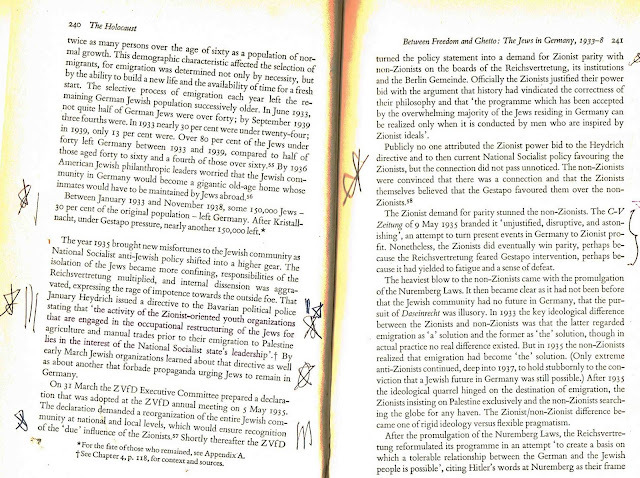 According to Rabbi Sarah, the vast majority of Polish Jewry, 90% of whom were exterminated, were also anti-Semites. The 'equation of Nazism with Zionism' is anti-Semitic. Presumably Hannah Arendt (above) was anti-Semitic too? Far from anti-Zionists being anti-Semitic it is Elli Sarah who comes closest to this. She has contempt for the Jews who died in the holocaust even though she is happy to use them as the alibi for a state that is modelled on the same principles as the European fascist countries, Nazi Germany included. 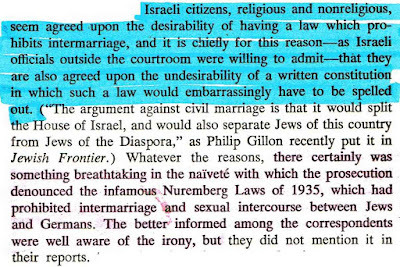 Hannah Arendt pointed out, in her book ‘Eichmann in Jerusalem’ how ironic it was that the Nazis Nuremberg Laws were denounced during the Eichmann trial when in Israel too it was impossible for a Jew and a non-Jew to marry. Elli Sarah’s essay is completely divorced from the reality of Israel today. A demonstration of thousand Jews in Tel Aviv 3 weeks ago supported the soldier who executed a severely wounded Palestinian in the head. Some 60% of Israeli Jews supported his action. The demonstration was held under a banner ‘Kill them all’ and the chant went up ‘Death to the Arabs’. One Jewish journalist, David Sheen, who was though to be from the human rights organisation Bt'selem, was beaten up. Because human rights NGO's have been targeted by the Netanyahu coalition. Indeed one banner said ‘My loyalty is my honour’ the slogan of the SS! Just 8% of Israelis define themselves as leftists. We have as Israel’s new Defence Minister a man, Avigdor Lieberman, who has spoken of beheading Israeli Arabs and drowning thousands of Palestinian prisoners in the Dead Sea. His Deputy Eli Dahan describes Palestinians as beasts and remarked that ‘“A Jew always has a much higher soul than agentile, even if he is a homosexual.” I guess that his concession on gays is some progress. Nor are Dahan and Lieberman unusual. According to Pew’s Israel’s Religiously Divided Society a plurality of Israeli Jewish voters want to expel Arabs and 79% believe Jews should receive preferential treatment. Israel is an apartheid society. It is a state, not of its own citizens – Jewish and non-Jewish - but of all Jews, wherever they live. Why should Elli Sarah and me have the right to ‘return’ to a country we have no attachment to when Palestinian refugees, who were expelled in 1947-8 have no such right? Why should Jews have the right to lease 93% of Israeli land when Arabs have no such right? 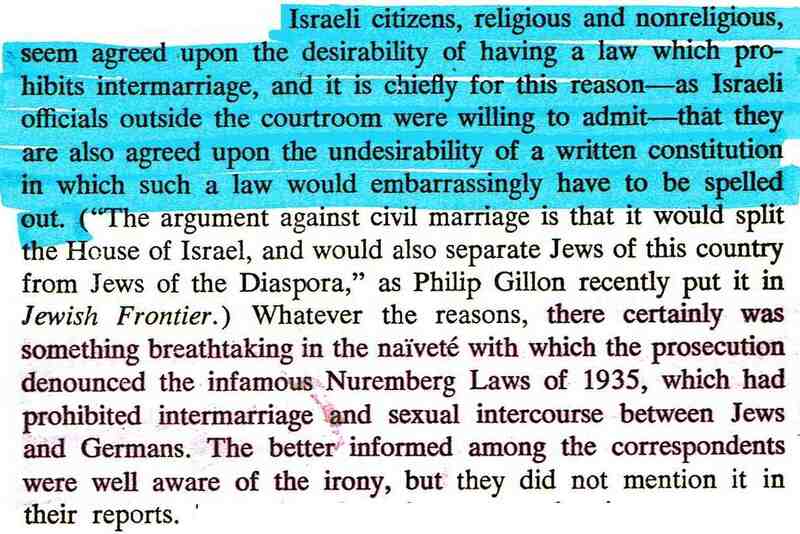 Does the fact that a book, Borderlife, was banned by Israel’s Education Ministry from high school English syllabuses because it depicted a relationship between Jewish and Arab teenagers and thus threatened Jewish ‘national identity’ not have eery echoes of the 1930’s? Does not the refusal to admit refugees, because of Israel’s Jewish ‘national identiy’ not give her pause for thought? Or do examples of Israel’s racism cause Elli Sarah’s brain to go on vacation? Borderlife was banned for the same reasons that the Nazi Nuremberg Laws banned miscegenation, an ugly word that was first used in relation to the Deep South of America, i.e. sexual relations between Jew and non-Jew. The Israeli government funds an openly fascist organisation Lehava which campaigns against mixed Jewish-Arab relationships and whose leader Benzi Gopstein openly callsfor the burning of mosques and churches. If British Jews were treated in the same way as the Palestinians Ms Sarah would be the first to shout ‘anti-Semitism’. Elli Sarah knows that she can’t defend the indefensible. She therefore resorts to the same defence that supporters of apartheid South Africa use: ‘why don’t you protest the Black African states. Their human rights record is worse than ours.’ The answer then and now is that Apartheid is a particularly unique evil. The suggestion that we single out Israel amongst all the other countries for reasons of ‘anti-Semitism’ is risible. Israel is 'singled out' because it singles itself out. It says it is the Middle East’s only democracy. It receives the highest US aid of any country in the world. Motions condemning its settlement activities are routinely vetoed by the USA in the UN Security Council. Israel receives favoured nation trading status in the EU. It even competes in the Eurovision despite being in the Middle East. Israel likes to portray itself as a western country but its chorus of apologists complain when we hold it to its self-proclaimed standards. Israel is a democracy for Jews and a Jewish state for Palestinians. Its democracy is but skin deep. It has rigorous military censorship, administrative detention (internment without trial), it holds secret trials where even the name of the defendant cannot be mentioned, it uses torture regularly against Palestinian detainees (and recently when Jewish terrorists were tortured there was a mighty uproar). It maintains two legal systems in the West Bank (military courts for Palestinians and civil courts for Jews) which is as good a definition of apartheid as it gets. If the ‘Jewish’ state was Jewish in the same way Britain is Christian, i.e. a constitutional adornment, then there could be little complaint. If Israel was simply a place of refuge for Jews suffering persecution, that too would be acceptable. However Israel isn’t even that. When the only post-war neo-Nazi government came to power, under the military junta in Argentina (1976-83), when up to 12% [3,000] of those who disappeared [i.e. died under torture] were Jewish, Israel turned its back. 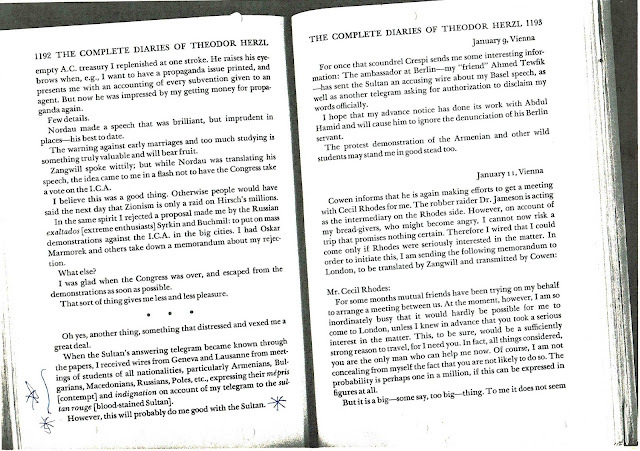 As the late Yossi Sarid MK of the left-Zionist Meretz observed, ‘‘the government of Israel never once lifted a finger and co-operated with the Argentine murderers because of their interest in arms deals….In Argentina, Israel sold even the Jews for the price of its immediate interests.’ “Yes, I Accuse,” Ha'aretz, 31 August 1989. I suspect Elli Sarah has never read Jacobo Timmerman's book 'Prisoner Without a Name, Cell Without a Number' of his experiences in prison in Argentina. He was a prominent editor and a left-Zionist (or at least he was until he went to live in Israel!). In her attempt to prove ‘anti-Semitism’ Elli Sarah focuses on Naz Shah’s facetious joke about transplanting Israel to the United States. In fact the map she used came from the Jewish Virtual Library! The remark came about during Israel’s attack on Gaza when over two thousand people, including 551 ‘terrorist’ children were murdered. Perhaps Ms Sarah has forgotten the chant of the Israeli mob 'There's No School In Gaza,There Are No More Kids Left' This at a time when Israelis moved armchairs and a coffee machine to a hill overlooking Gaza so they could enjoy the bombing. The hypocrisy of these holocaust mongers is best demonstrated by the fact that they pick up on Naz Shah's reference to the 'transportation costs' of moving Israel to the United States (note that it is automatically assumed that it is only the Jews of Israel who are involved). 'Transportation' symbolises death trains to Auschwitz. It is as if Jews never use the word transport, still less trains for fear that they might be carted off to an extermination camp! What utter hypocritical rubbish. Unfortunately Naz Shah was intimidated, like the defendants in Stalin's purge trials, into admitting her guilt. Elli Sarah speaks about the Holocaust survivors who found refuge in Israel. In fact most of them wanted to go to the United States not Israel but their path was blocked by the opposition of the Zionist movement in the USA. They have become the alibi for the Israeli state but Israel’s use of the holocaust as a propaganda weapon is in stark contrast to their treatment in Israel. As Ha’aretz (6.2.13) noted, ‘Israel Is Waiting for Its Holocaust Survivors to Die’ as it then won’t have to pay them the meagre benefits they receive. Ms Sarah refers to the kibbutz movement as an ‘ideal way of living as a Jew’. She omits to mention that they were institutions founded on land from which the Arab peasants had been evicted and of which only Jews could be members. 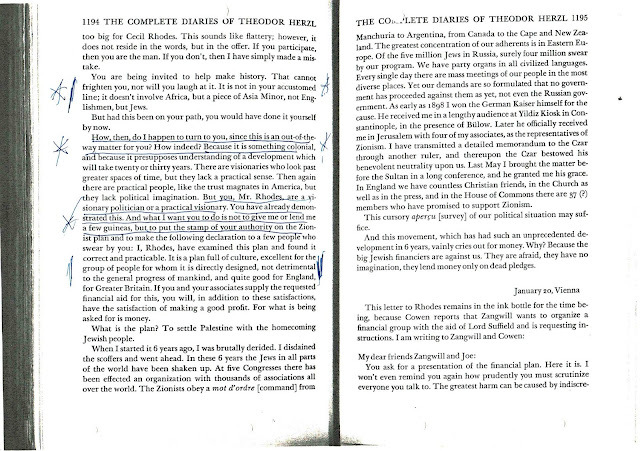 In other words they were racially exclusive clubs, stockade and watchtower settlements. 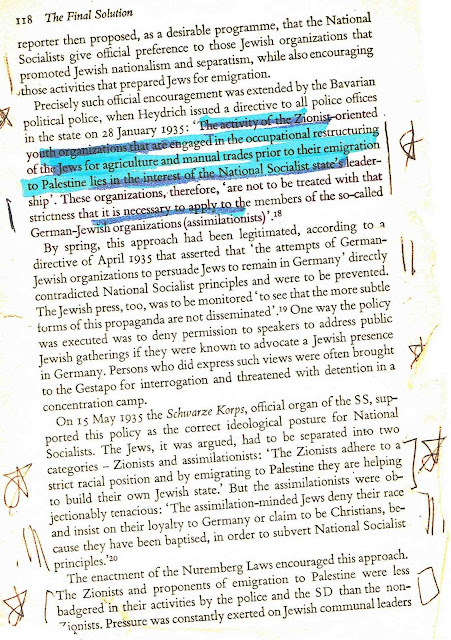 Elli Sarah states that there is no historical evidence that Hitler supported Zionism. In fact there is a lot of evidence that the Nazis favoured the Zionist movement over and above all other Jewish groups before and even after 1941. There is the Kasztner trial in Israel when survivors of the Hungarian holocaust accused the Jewish Agency and its representative Kasztner of collaborating in the round-up and entrainment of the Jews. The verdict of the Jerusalem District Court brought the second Israeli government of Moshe Sharrett down in 1955. This isn't so. Elli Sarah and I live in Britain as full citizens. It is as much our country as anyone else’s. Only anti-Semites and Zionist proclaim otherwise. When Ms Sarah proclaims that ‘One of the main objectives of the early Zionists was the ‘normalisation’ of the Jewish people.’ She is accepting the anti-Semitic trope that Jews were abnormal. It is somewhat ironic that Rabbi Sarah then goes on to accuse others of ‘anti-Semitism’! Once thing is for certain. Elli Sarah and all the rest of the Zionist claque will play no part in opposing the real neo-Nazis who will try and march in the streets of Brighton. Zionism never has opposed anti-Semitism. It is far more interesting in painting the opponents of anti-Semitism as anti-Semitic. Zionists have no interest in opposing anti-Semitism except where defence of the State of Israel is concerned. That is the lie at the heart of Rabbi Elli Sarah’s thesis. 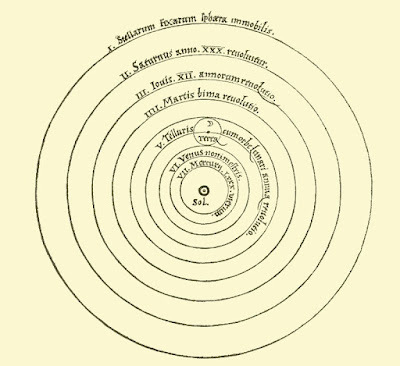 In 1633 Galileo was convicted for Heresy by the Inquisition for arguing in support of the Copernican belief that the Earth revolved around the Sun. 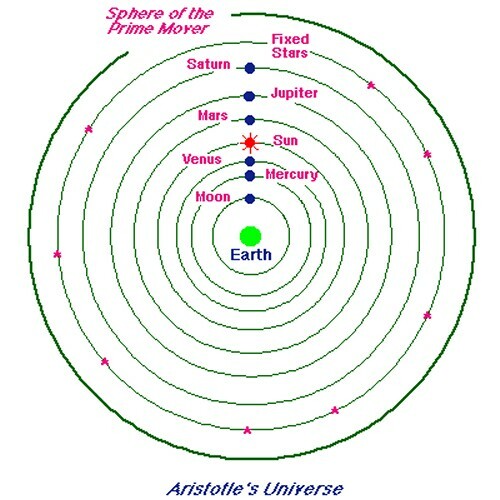 This was despite the fact that most of the scientists and philosophers at the time were convinced that the Aristotelian concept of a stationery Earth, around which the Sun and planets moved, was false. 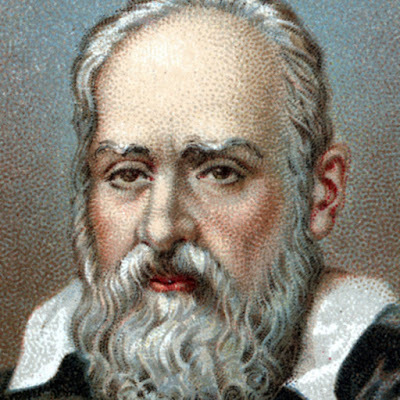 Galileo’s problem was that scientific evidence, logic and observation conflicted with the ideological needs of the system he lived under. 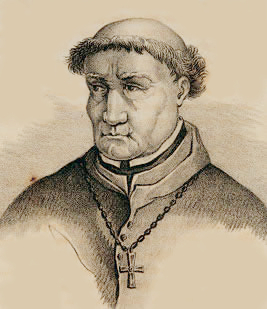 A reordering of the heavens challenged the very basis of the theological precepts by which Papal rule was maintained. 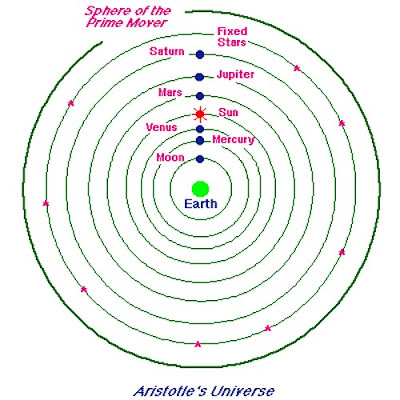 Galileo wrote to the German mathematician Johannes Kepler ‘"what would you say of the learned here, who, replete with the pertinacity of the asp, have steadfastly refused to cast a glance through the telescope? What shall we make of this? Shall we laugh, or shall we cry?" 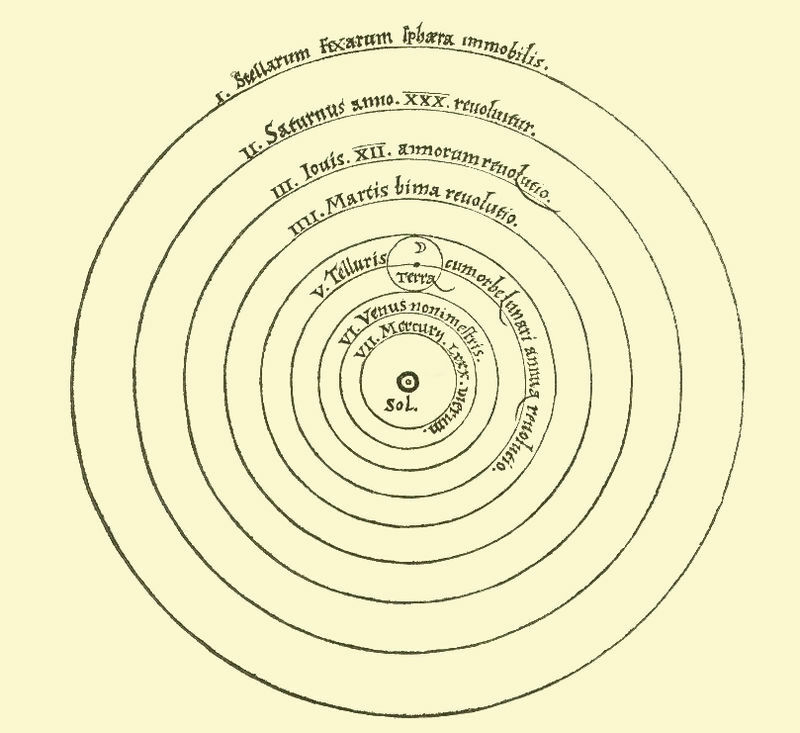 I am reminded of Galileo’s travails since the heresy hunt in the Labour Party makes it an expulsion offence to even hint that Zionism is racist or to compare Israel in any way with the Nazis. Indeed even to pretend that Israel is anything other than a fine, democratic example to the rest of the world, a beacon of freedom, is not only reason enough for suspension but prima facie evidence of ‘anti-Semitism’. In the Labour Party today there is a similar refusal to look through the telescope or perhaps it is the turning of a Nelsonian blind eye to the Israeli state as it actually exists. Israel is a state which permanently rules over four and a half million Palestinians, who cannot be granted the vote or any measure of civil rights, because that is incompatible with a ‘Jewish State’. It is a situation whereby there are two different systems of law– one for Palestinians and another for Jewish settlers. Even within the non-existent Green Line, Israel’s own Arab citizens are there on sufferance, with a plurality of Jewish voters wanting them expelled. Apartheid may not be officially declared, but it is practical politics. The Labour Party now exists in a parallel universe whereby black is white and truth is false. The laws of logic have been suspended. How else can one describe a situation whereby those who support the world’s only apartheid state are the ones defining what is and is not racism? In recent weeks, Ken Livingstone has been suspended for mentioning the relationship of the Nazis to the Zionists, David Watson has been suspended for claiming that Zionism is racist and I have been suspended for, among other things, claiming that Zionism is a Jewish form of anti-Semitism. There is a universal consensus in the media, that extends from the Guardian to the Daily Mail, that anyone who criticises Zionism is anti-Semitic. The mere suggestion however that Israel is anything other than the purest form of Athenian democracy is like to result in Labour’s Inquisition bearing down on them, presided over by Torquemada in the form of John Mann MP. Events however have a habit of defying even the most prosaic of ideologues. In the past week alone Israel’s Deputy Chief of Staff, General Yair Golan has compared developments in Europe, particularly Germany in the 1930’s to Israel today. [IDF general in bombshell speech: Israeltoday shows signs of 1930s Germany, Jerusalem Post, 4.5.16.] Yair’s speech at a ceremony remembering the Holocaust led to a series of events which culminated in the removal of Moshe Yalon as Israel’s Defence Minister. Lieberman agreed to join Netanyahu’s Likud coalition on the basis that he could introduce the death penalty. Naturally the death penalty will only apply to Palestinians since only Military Courts, which have a conviction rate of some 99.7%, will have the power to impose it. Jewish settler terrorists are tried in civil courts. We have an Alice in Wonderland situation in the Labour Party whereby the Jewish Labour Movement, which supports the Israeli state and its founding ideology, Zionism, is to be put in charge of anti-racism training by Baroness Royall, who investigated ‘anti-Semitism’ at Oxford University Labour Club. 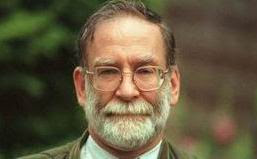 Its akin to having the late Dr Shipman given responsibility for developing a course in medical ethics. The JLM is affiliated to the World Zionist Organisation, which is responsible for the funding and development of settlements in the West Bank. Its institutions are key to the maintenance of Israeli Apartheid, both in Israel itself and the Occupied Territories. Since the JLM excludes from membership anyone who is not a Zionist or supporter of the Israeli state, it would be more honest to call it the Zionist Labour Movement. Almost everyday people who criticises Zionism, the movement which founded the Israeli state, are being suspended for ‘anti-Semitism’. 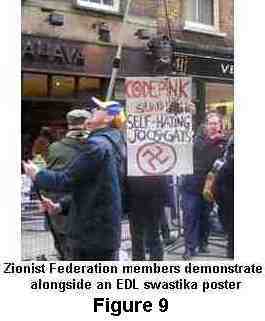 Although it is anti-Semitic to equate Jews and Zionism, anyone who criticises the latter is deemed anti-Semitic! Jackie Walker, the Vice-Chair of Momentum, has been suspended for mentioning the involvement of Jews in financing the slave trade. She is herself both Black and Jewish. [Jackie has since been reinstated] It is one of Zionism’s myths that anti-Semitism is a seamless continuum of Jewish oppression for two thousand years. Jews were always victims never perpetrators. It was this, the ‘lachrymose version of Jewish history’ that Salo Baron, perhaps the greatest Jewish historian of the 20th century railed against. I will shortly be appearing before an investigation meeting. 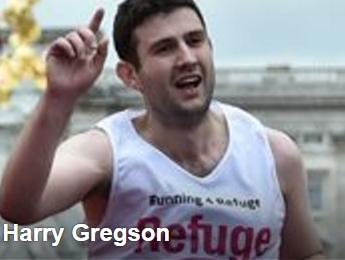 It would appear that the Acting Regional Organiser for the South-East Harry Gregson, has gone into overdrive trying to find some incriminating evidence against me. It is a strange process whereby you first suspend someone and then begin trying to find the evidence to justify the suspension. One of the charges against me is that I wrote a blog post entitled ‘Israeli Policy is to wait for the remaining Holocaust survivors to die’ This was deemed such a terrible accusation by Gregson that it must be anti-Semitic. It is beyond dispute that Israel is parsimonious in the extreme in withholding benefits from holocaust survivors. Thousands of holocaust survivors in Israel live in dire poverty, forced to choose between heat and food. Israel has received billions of shekels in reparations from the German state. It has preferred to spend them on holocaust memorials and holocaust ‘education’, to say nothing of weaponry rather than on the holocaust survivors themselves. 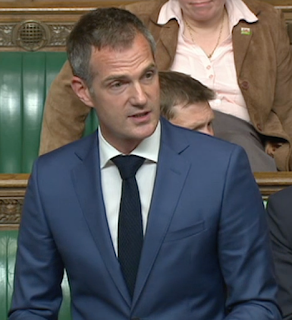 The true reason for my suspension though may lie in one other charge that I am facing, namely that I have called for the deselection of Peter Kyle, the New Labour MP for Hove. Kyle is someone who believes fervently in private involvement in the NHS. He voted for bombing Syria and is a darling of the Progress wing of Labour. The anti-Semitism witch-hunt in the Labour Party has one overriding purpose. It is not just about sanitising Israel. Its primary purpose is the removal of the Jeremy Corbyn leadership of the Party. Co’s appeasement of the Right in the Labour Party is a recipe for defeat. Its only effect is to whet the appetite of Labour’s McCarthyists. In the Roman Catholic Church you have to wait until you are dead before they canonise you and make you into a saint. Hedy Epstein was one of the few people who became a saint during their lifetime. A holocaust survivor, she became an implacable opponent of injustice. Because she was Jewish she, like so many of us, felt a particular need to speak up against racism perpetrated in the name of Jews. But Hedy was to be found wherever injustice showed its head. She went on the boat to Gaza and was arrested in Ferguson, Missouri. Above all Hedy learnt the lesson that the Zionists could never hope to understand. The Holocaust should have been the reason to oppose all racism, not to justify or condone Jewish racism. Hedy, I salute you. You will be missed. The following obituary for Hedy Epstein was sent to us by Dianne Lee. 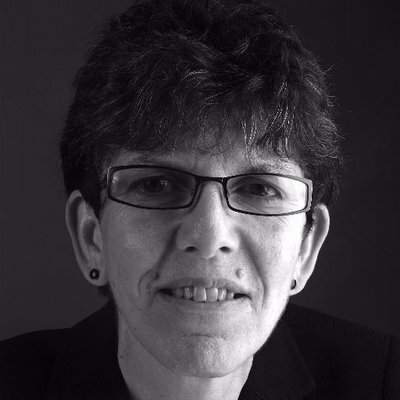 Epstein was a friend and mentor to us at Mondoweiss, and she will be sorely missed. Born August 15, 1924, in the Baden-Württemberg region of Germany, her lifelong commitment to human rights was formed by the horrific experiences she and her family endured under the repressive Nazi regime. Three days after her 90th birthday, Hedy was arrested for “failure to disperse.” She was attempting to enter Missouri Governor Jay Nixon’s St. Louis office to ask for deescalation of police and National Guard tactics which had turned violent in response to protests following the killing of unarmed teenager Michael Brown in Ferguson, Missouri. Hedy was a member of the St. Louis Holocaust Museum and Learning Center’s speakers’ bureau and gave countless talks at schools and community events. She shared her Holocaust experiences with thousands of Missouri youth as a featured speaker at the Missouri Scholars Academy for more than twenty years. She ended every talk with three requests: remember the past, don’t hate, and don’t be a bystander. Through the years, Hedy received numerous awards and honors for her compassionate service and relentless pursuit of justice. Hedy always did her best, and the difference she made is evident in the commitment and passion of those called to continue her work. Her friends and admirers honor and salute her deep and lifelong dedication to tikkun olam, the just re-ordering of the world and promise to remember, to stay human, and to never be bystanders. Much of her activism was focused on advocating for Palestinians under Israeli occupation. Hedy Epstein fled Germany during the Holocaust and later protested injustice in the U.S. and abroad. 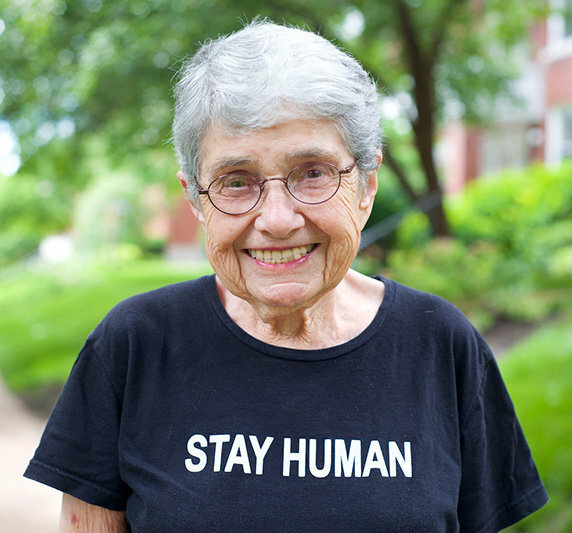 Hedy Epstein, who fled the Nazis as a child in Germany and later protested what she saw as injustice in the Middle East and near her home in St. Louis, died Thursday, her friend Dianne Lee told The Huffington Post. She was 91. Epstein’s long career in activist circles began when she was a teenager and continued for the rest of her life. At 90, she was arrested in St. Louis for “failure to disperse” while protesting Gov. Jay Nixon’s deployment of the National Guard to quell protests in Ferguson, Missouri. Advocating for Palestinians under Israeli occupation was one of her core commitments. She traveled to the West Bank and attempted several times to sail to Gaza in recent years to protest Israel’s blockade of the area, according to an obituary that Lee wrote. Along with dozens of other Americans, Epstein boarded the Audacity of Hope in 2011 on one of her trips to the region. The boat departed from Greece in an attempt to join a flotilla trying to break Israel’s blockade of Gaza. Greek authorities quickly stopped the vessel and returned it to port, but Epstein tweeted about the experience. Our wonderful captain negotiated with them. We were in a holding pattern for probably 3 hours when the commandos arrived with drawn weapons. I’m below deck surrounded by a doctor and a nurse and wonderful other people. Our spirits are high. I’m calm, unafraid, hopeful. Epstein was born in the Bavarian region of Germany in 1924 as Hedy Wachenheimer. Her parents sent her to England at age 14 to escape the rule of Adolf Hitler, according to Epstein’s personal webpage. Most of her Jewish family, including her parents, did not survive the Holocaust. In 1945, she returned to Germany to work for the occupying U.S. forces, and the following year she became a researcher for Nuremberg prosecutors in the war crimes trials of German doctors. Epstein immigrated to the United States in 1948 and eventually settled in St. Louis in the 1960s. In that city, she volunteered with the Freedom of Residence, an organization demanding fair housing laws and an end to segregation. In the 1970s, she became executive director of the group’s St. Louis chapter. According to Lee’s obituary, Epstein’s advocacy knew no limits. She took a stand against the Vietnam War, spoke up for the plight of Haitian boat people, and demanded women’s reproductive rights. 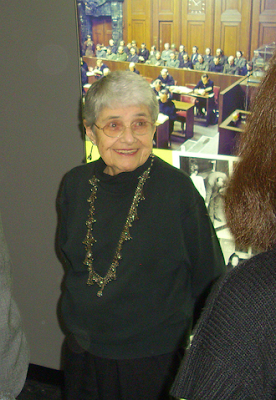 Epstein often spoke to young people about her life through the Missouri Scholars Academy. She ended each talk with the same advice, according to Lee. “Remember the past, don’t hate, and don’t be a bystander,” Epstein often said. Epstein is survived by her son Howard “Terry” Epstein and granddaughters Courtney and Kelly.